As I’m sure everyone knows by now, colouring-in is the latest in fashionable things for grownups to do. But perhaps not everyone knows that there is actually reputable scientific research that shows that colouring-in actually works to reduce stress, and that it’s a good alternative for people who just can’t take to other strategies such as meditation. I wish I could find the online article that I read that showed that neuroscientists had shown that the brain responded positively to certain types of colouring activities … and that it can reduce blood pressure too. That article made it clear that it doesn’t work with any old colouring-in. Disney Cinderellas and Nemos are not going to have the same effect on mindfulness: prismatic and symmetrical designs are the best because there’s a kind of rhythm to the way they are completed. What forces the brain to slow down and relax is, as I recall the article, the need to concentrate on keeping within the lines, and maintaining the colour patterns that you choose. 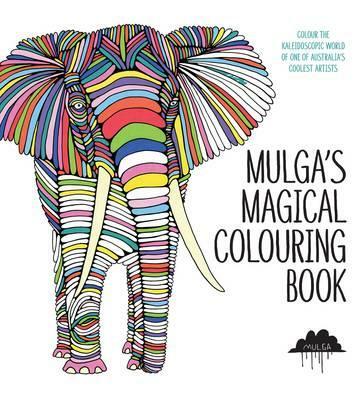 Mulga’s Magical Colouring Book is fun, but restful it’s not. Mulga a.k.a. Joel Moore is apparently a well-known street artist in Sydney, and his designs are quirky and humorous. There’s a toucan with a beanie, Pineapple Head Fred, Captain Gorilla and Pronger the Peacock. These designs are, to use the parlance of teenagers, very cool, and very hip. While not quite in the spirit of mindfulness self-help, it may that this liveliness is a good thing, because so many young people today seem to be stressed about what should be the best time of their lives, and maybe the ‘coolness’ of this book might make using it for relaxation ‘cool’ too. Just one quibble: some of the designs have large areas that are already filled with black. This might suit Goths, but I think it defeats the purpose of a colouring book if large swathes of the design can’t be coloured. I haven’t found the original article that tempted me to buy one of these adult colouring books, but I’ve found this instead: it’s Michael Cathcart’s interview on ABC RN with consulting neuropsychologist and neuroscientist Dr Stan Rodski, entitled The Science behind Adult Colouring Books. Rodski says research shows that in order to achieve the beneficial effects i.e. changes in heart rate and brainwaves which are indicators that the activity reduces stress, there are three key elements—repetition, pattern and detail—that prompt positive neurological responses. That is why he favours patterns and shapes in his books rather than defined pictures or scenes. Hi Teresa, if I’ve bought the book myself and it has the bookseller’s price tag on it, I usually do include where I bought it and what it cost, but if it’s an ARC (advance review copy), I often don’t know what the RRP is going to be. However I usually include a link to Fishpond under the availability heading, which although a discount online store will give an idea of the cost. I forgot to do it for this one, sorry! I bought this book for a friend just this week, for her birthday and she really liked it. Colouring books have certainly taken off! Hi Sonja, I bought one after a friend told me she was using them. It’s just called Adult Coloring Books, featuring Mandalas, Flowers and Geometric Designs. (ISBN 9780996275422) I use it sometimes when I can’t get to sleep and it is quite calming. LOL maybe it’s because kids have such short attention spans these days!